Loppers are the perfect middle ground when secateurs just won’t do and when a pruning saw would be excessive. Conversely, loppers that claim to do a good job flood market, and most do. Only a few, though, do that best of jobs. With this in mind, I’ve listed and reviewed the six best loppers for excellent pruning every time. Why Do I Need Loppers? 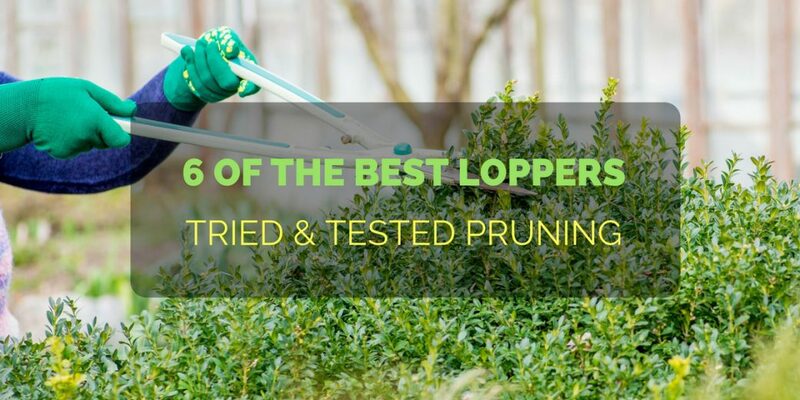 With thicker branches, especially ones that are not in arm’s length, loppers provide both the reach and the leverage needed for excellent pruning. However, loppers do come in all shapes, sizes, and prices. This article will help you narrow down those choices and help you find the perfect lopper for your garden! Firstly, I’ve divided the loppers into two categories: Bypass loppers and Anvil loppers. We’ll see more info on these two categories in the buyer’s guide section of this article. Second, you should start considering how far a reach you’d need for your lopper. The ones I’ve reviewed range from 20inches to a telescopic-40inch. Let’s take a quick look at them below. Yes, you already have a pair of trusty pruning shears, and they do a great job. However, you’ve most likely avoided cutting thick branches with regular secateurs. And for a good reason, since thicker branches can break them. For branches 1-inch to 2-inches thick, a good lopper will be best, especially for branches that are out of reach. Hence, loppers have long handles, often 20inches or longer. Some even have telescopic handles or handles that extend further, for even more range. Handle length not only provides reach but also gives you more leverage, so cutting branches become much easier. Loppers with gears or compound-lever systems are also available when sturdier branches require additional force. Mainly, though, there are two distinct types of loppers. As I’ve mentioned at the outset, we’ll be looking at six of the best loppers, three of which are bypass loppers, while the other three are anvil loppers. These two categories refer to the kind of blade that a lopper may have. Both lopper types have their uses, strengths, and weaknesses. Best consider these points before you get one. The curved blades easily identify bypass loppers, which are the more common of the lopper types. These blades function and look very similar to regular pruning shears. Moreover, pruning with these loppers keeps your plants healthy. Thus, bypass loppers should always be kept sharp as the health of the plant depends on the smoothness of the cut wood. So it is not recommended to use a bypass lopper for very tough, old or dead branches. Blades may deflect resilient/brittle branches, becoming a risk for both tool and user. On the other hand, Anvil loppers have only one blade that closes onto a flat edge or anvil. This type of lopper works like a knife to a cutting board. Also, a softer material makes up the anvil part of the blade. What’s more, anvil loppers often have more cutting power, as compared to bypass loppers, and are capable of handling thicker branches. Due to its design, anvil blades tend to crush instead of cut branches. Hence, these loppers would be best used for dead stems or trimming branches before finally using a bypass lopper for a much cleaner cut. Anvil loppers are also effective when you need to cut pruned and fallen branches for kindling, firewood, or easy disposal. When deciding whether to use a bypass lopper or an anvil lopper, always consider the health of your plant. Bypass loppers are most useful when pruning live plants. Conversely, Anvil loppers are most useful for dry, brittle, or dead wood and for making preparatory cuts before using bypass loppers. A blade’s cutting power refers to both its capacity to cut and the mechanism it employs. The best loppers have a cutting capacity of up to two inches of wood in diameter. Ultimately, the best lopper will reduce the effort needed to cut branches. It’s important to note that a blade’s cutting capacity don't make you, the cutter, stronger. A lopper might be capable of cutting a thick branch, but our fitness levels differ so some may be strong enough to cut these branches while others cannot. Blade mechanisms solve this particular predicament by adding leverage, making it easier cutting through tough branches. Although not apparent in all designs, there are three mechanisms that give loppers more force to power through those two inch-diameter-branches with ease. Depending on you pruning needs, you may opt to get a lopper with or without these features. When a branch is particularly tough, a lopper’s ratcheting mechanism latches, allowing you to release the handles and squeeze again (and repeat) until the branch is cut. Here’s a helpful video displaying the ratcheting mechanism. It’s most obvious near the end of the video. A lopper with a compound action mechanism, as shown below, has pivot points and moving parts that make a quick and powerful cut. As the name suggests, loppers with this mechanism utilize gears for more cutting force. An example of a geared lopper is shown below. Ideal lopper blades should be incredibly tough to withstand impacts with normal, everyday use. High carbon steel blades last very well and are less prone to nicks, bending, or dulling blades. Good blades also employ a form of a coating that will resist sap and other sticky plant material, and rust as well. Some lopper brands may have blade adjustment as an added feature. Being able to adjust how close or far the blades are from each other will be helpful when the blade jams or when the blades need tightening after some time. A lopper’s handle will vary among brands and designs. Depending on your specific pruning needs, always consider if you need more length, which will be heavier but will have more leverage, or if shorter lighter handles will do. Like the loppers themselves, lopper grips come in all colors, shapes, materials and sizes. You’d want to choose a lopper with a comfortable grip. Comfort, however, differs from person to person so choose one that is comfortable for you. Grips can be made of soft foam, reducing impact and fatigue but more prone to damage. On the other hand, grips can also be firmer and contoured to fit your fingers. Again, a good grip is one that is comfortable for you. A comfortable grip becomes even more important when you have a lot of pruning to do. An often overlooked feature is the bump present between the handles, usually near the base of the blades. These bumps, mostly made of rubber, keep your hands and fingers from being crushed when you squeeze the handles during cutting. As mentioned, one factor determining a lopper’s weight is the length of its handle. Another factor affecting a lopper’s weight is its material. Handles that are thicker and more solid, usually made of hardened steel, will fit heavier cutting duties. On the other hand, other materials such as aluminum will do fine for lighter work. Like comfortable grips, the right lopper weight will depend on your preferences and the amount of pruning needed. Loppers endure a lot of wear and tear through use, and they will, inevitably, break down at some point. Lopper breakdown is especially true for those with more moving parts, such as ratcheting and compound action loppers. Buying a brand new lopper would be costly. Therefore consider if parts for your lopper area easily sourced in your area or if there are service centers for your loppers brand nearby. A high-quality lopper will often have replacement parts ready for purchase from manufacturers. Furthermore, a removable blade bolt would mean that the blades are replaceable. With all these factors in mind, let’s get to the all-important reviews and see which of the six best loppers will suit you best, dear gardener. Blades are rust-prone and may get nicks after some use. Handles become prone to bending when fully extended. There you have it! The six best anvil loppers for perfect and easy pruning. Do you think we missed a good lopper? Let us know!